Going through the old photographs I have unearthed for this part of the NEST work has been quite disarming in many respects – not the least of which has been the brief glimpse they have offered of the many and varied contexts in which my own parents found themselves. These were other worlds and lifetimes that they carried within themselves always, but that I can never hope to really understand or access. This is particularly true in my father’s case; he wasn’t a talker, wasn’t prone to providing stories about himself. I am fortunate enough to have a fairly broad photographic record of his early life, though, which offers some small indications and hints about his existence. I do remember him saying once, upon coming across George Orwell’s Down and Out in Paris and London that he didn’t need to read it; he’d lived it. He didn’t elaborate. Odd in some ways to think that he was born over a century ago. 1911. 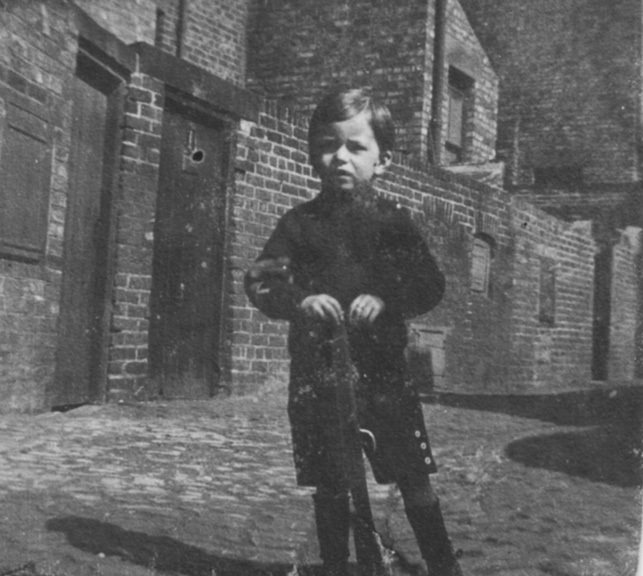 This is one of the earliest photos I have of my Da, taken in the back lane behind the house in which he was born in Tynemouth, Northumberland. 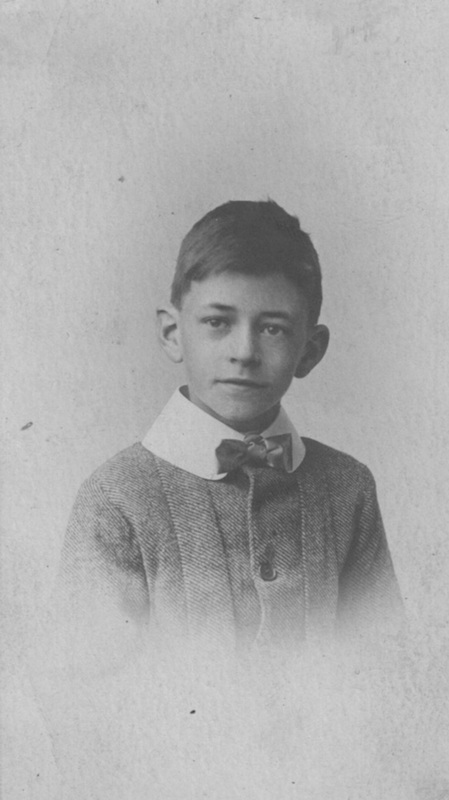 I think he was about 4 or 5 when this was taken, so that would date the photo to about 1915 … during WWI. His father would have been in active duty, in the British Army, Artillery. Here he is a few years later (the inscription on the back states he is 8 years old). He doesn’t seem terribly impressed to be having his portrait done, nor to be wearing that stiff collar and tweedy suit. So formal, and such a serious occasion. So very different from the world I knew of annual children’s school photos (my own and that of my children), the now omnipresent camera phones and interminable ‘selfies’ of today. The War was likely done by then, but I expect that it was still tough going in Tynemouth, being a naval and port city on the North Sea. Not much of the man who I knew as my father there yet, but some … the set of his eyes and brows, the ears(!) … . His hair seems to grow in a similar pattern as mine (though he was always bald on top in my recollections). 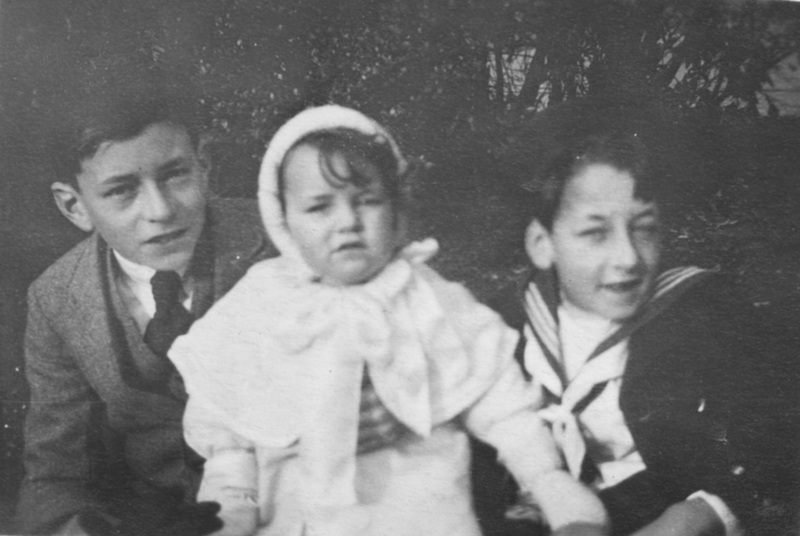 This is, I think, the only photo I have of my father with both of his siblings. An odd thing, that. Again, my father, formally dressed, serious expression for the camera. His younger brother and baby sister somehow permitted the costume of childhood where he was not. I don’t know how old he was here, perhaps a couple of years older than the previous shot. A family falsity: I had been told that his brother was the eldest … this was obviously not the case, but I don’t know why I was told that by both my parents. It also appears that the role of first/eldest son was adopted early on, and was a position to be assumed with gravity. I wonder what that did to his relationship to his brother. He never spoke much of him at all; only to say that he had returned to England not long after the family settled in Canada, and that they never heard from him after that. I don’t know how much of this is true, any more than I know why I was told the things I was that have been revealed to be otherwise. There are large gaps in what record I do have of my father’s life, visual and otherwise; for starters, my father only reappears in Grannie’s photo album when he is a grown man. Most of the photos of him from this point on document his working life in some way or another. Here, a live radio broadcast, from where I don’t know. From the clothing – and my father’s youth and full head of hair – I would guess he’s in his early 30’s. 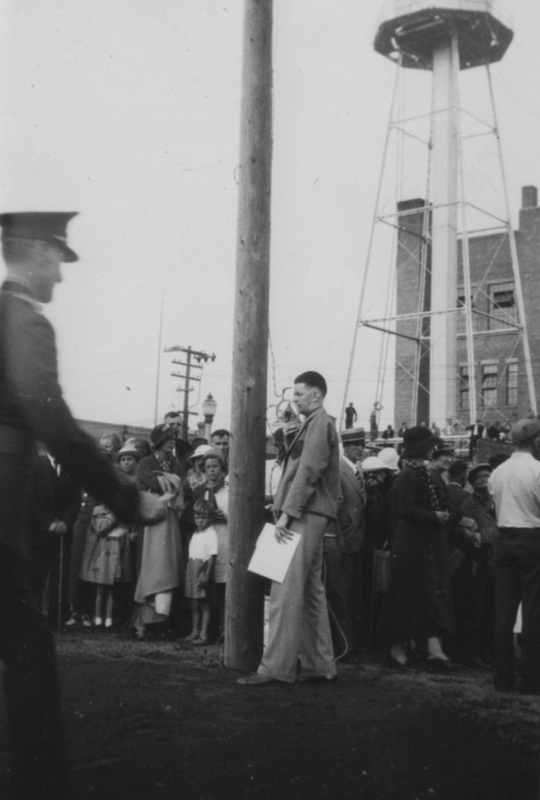 So, sometime in the 1940’s, perhaps … the uniformed man in the foreground points to that timing as well. 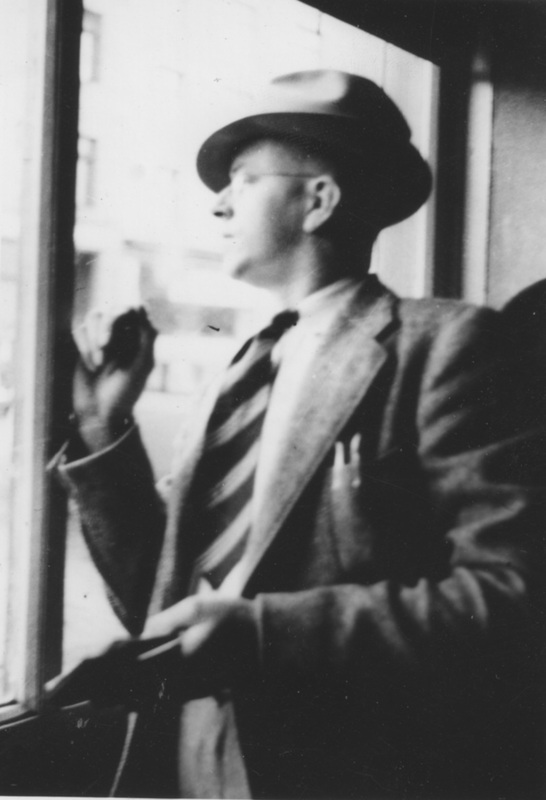 Another undated image of my father, working. He appears to be taking notes on what he is witnessing. There were a few things that were somehow fixed in my mind when it came to my father: the suits he wore, and his work. Always, his work. Reporting – and broadcasting in particular – was a huge part of who he was, and how he framed himself to the world, and even to us at home. He put on that identity. It kept people out; it kept him feeling safe in a way too, I suppose. When all else failed, one could always talk about the day’s news. Such fabulous old photos, Sydney! And so interesting to be the detective of your own family. It definitely was a different time then…I think of how many photos we take today of our families … never asking for a serious sit down pose but somehow intent on capturing every little move in their real environment. I love the honest sharing of your journey and discovery. Thanks Linda – and sorry to take so long to reply! Yes, it was such a different world then; hard in some ways to wrap our heads around just how different, and how quickly things changed. It’s an interesting process!